Row Apparel’s pre-selling service allows its customers to design and sell their products with low to no up front costs. Pre-selling also ensures minimal waste and inventory risks, and allows the customer to better gauge its target market’s style prior to placing a large bulk order and stocking inventory. Choose products, design graphics and approve mockups. See Production Process for more info. Additionally, a sample product can be printed and photographed for use in an online store and other marketing material. Restricted Availability: this strategy restricts the availability of online purchasing to a pre-determined timeline. It creates a sense of urgency that can yield higher and faster rates of purchase. Typical availability duration is one (1) week. The downside of this strategy is that order fulfillment is delayed as production does not start until the deadline is reached. If items are available for purchase for one (1) week then finished products won’t ship until two (2) weeks after the deadline. (3 weeks after the products are made available for purchase). Always Open: this strategy is a hybrid of traditional online sales and pre-selling. It allows Row Apparel customers to mitigate upfront production and inventory risks while still allowing their products to be indefinitely available online for purchase. Actual product production cycles are triggered by either time (aka Purchasing Cycle, typically 2 weeks in duration), number of purchases (varies per project and product), or a combination of both. The only constraint to the triggering of production cycles is that the minimum order quantity (MOQ) must be met (varies per project). At the end of a purchasing cycle, Row Apparel will aggregate all purchases, produce the products, and fulfill the orders. Similar to the Restricted Availability Strategy described above, order fulfillment extends the total process to 4-5 weeks. To help decrease fulfillment lead-time, production can be triggered by the number of products sold. When that number is reached (defined by Row Apparel customer), Row Apparel will initiate the production cycle to fulfill the orders. If the number of products is not reached within the establish purchasing cycle, but it exceeds the minimum order quantity, then Row Apparel will proceed with fulfilling that cycle’s orders. Restricted Availability <--> Always Open: this transition process allows Row Apparel customers to capitalize on the initial urgency brought on by the Restricted Availability Strategy, while still operating a traditional online storefront. This strategy can help launch new products or draw attention to existing ones, especially when a limited time discount is offered. Always Open --> Stocking Products: Purchasing products in bulk is beneficial in two ways: it reduces per unit costs and expedites order fulfillment. This Transitional Strategy allows Row Apparel customers to fully vet their product offerings while slowly building up stock. Using all, or part of the proceeds made during an ordering cycle, Row Apparel customers can purchase products in bulk and use them to fulfill future orders. This not only reduces upfront product costs, but the increase in quantity will result in a decrease of per unit costs and an increase in profits. 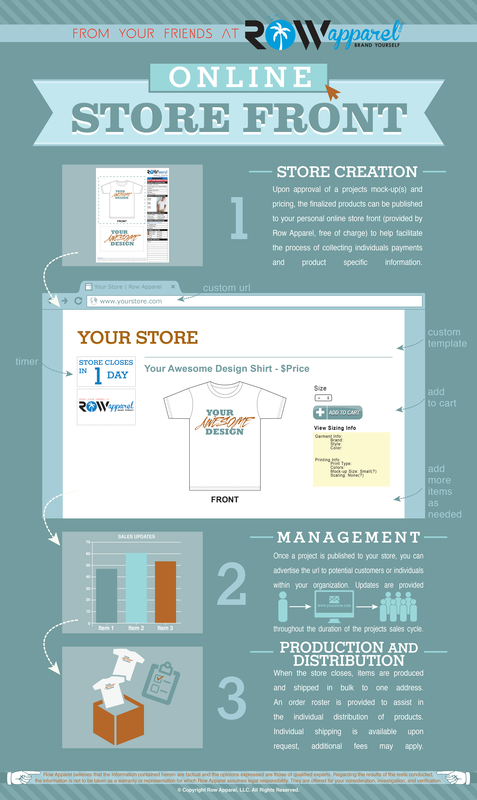 Row Apparel Customers direct their potential customers to their website via Facebook, Twitter, Pinterest, email, phone, print ads... etc. Production cycle is triggered (based on established Pre-Selling Strategy), orders are aggregated, products are produced and orders are fulfilled.